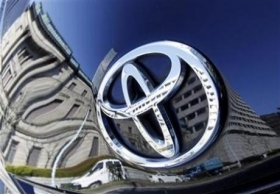 WASHINGTON (AP) -- Despite a congressional frenzy over Toyota's safety recalls, the besieged automaker reports that it spent substantially less money lobbying lawmakers during the first three months of this year than it did during the same period in 2009. How'd they do it? A loophole in federal lobbying rules that allows corporations to not report expenses for providing Congress with information when legislation does not exist and isn't about to be introduced. Toyota reported spending $880,000 in federal lobbying for the first three months of this year. That compares with $1.3 million in lobbying expenses for the much quieter first quarter of 2009. That drop doesn't mean there was a reduction in Toyota's legislative activities. It's just that Toyota says much of its work with Congress didn't meet the definition of lobbying activity under the Internal Revenue Service code, the regulations Toyota uses to report its lobbying. "The resources that normally go to legislative outreach were redirected to educating members of Congress, the steps the company was taking to improve safety and the quality process of our vehicles," Toyota spokesman Ed Lewis said Tuesday. "That's not lobbying. That's strictly education." Outside lobbying experts said Toyota's interpretation of the rules seemed plausible. "You have to look under the hood" at the details, said Kenneth Gross, a Washington attorney and lobbying expert. "But the law clearly gives you room to talk to legislators and educate them without it constituting lobbying" if no legislation is pending. Others expressed more skepticism. Craig Holman, lobbyist for the consumer group Public Citizen, said a company's legislative activity is not reportable only if there is no attempt to influence government policy, akin to delivering a neutral lecture. "That's just going to a university class. Why would Toyota be doing something like that, hiring lobbyists to do that?" he said. After recalling more than 8 million vehicles worldwide -- a figure that has since topped 9 million -- Toyota officials spent much of this year's early months testifying before congressional committees, submitting documents to Congress, and telling lawmakers and their staffs about steps the company was taking to handle the safety problems. Toyota has five full-time lobbyists in its Washington office, a figure that has not changed over the past year, said one company official who spoke on condition of anonymity to provide details. The official estimated that during the beginning of this year, lobbyists spent about two-thirds of their time providing information to lawmakers on the recalls. Another figure from lobbying reports, though, underscores how Toyota's congressional activities actually increased. For the first quarter of 2009, five lobbying firms reported a total of $200,000 in income from working for Toyota. For this year's first quarter, those figures grew: Nine lobbying firms reported $337,000 in earnings from their Toyota lobbying. Four of those firms' reports specifically mentioned activity related to the recalls. Whatever it spent lobbying, this year's first quarter was a profitable one for Toyota. It reported Tuesday $1.2 billion in profits from January through March, up from the $8.3 billion it lost during the same time last year.